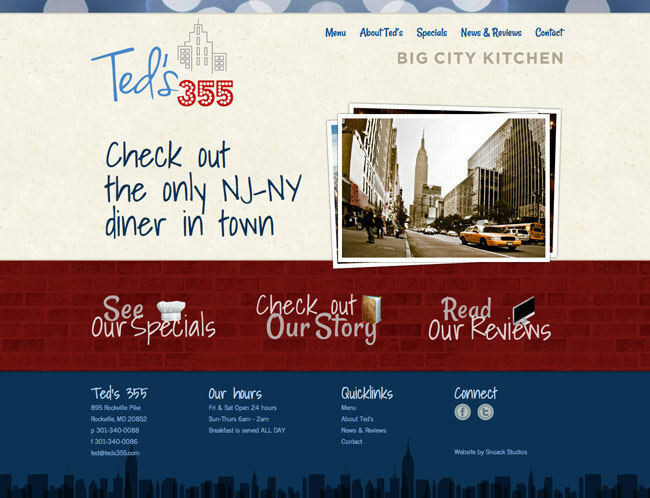 Ted’s 355 is a fun and family-friendly diner in Rockville, Maryland. We wanted to reflect their East Coast roots, family-friendly atmosphere and fun-loving diner attitude through the style of their new site. We used Google Webfonts to bring in 3 great fonts that are used throughout the site. They provide a lot of character, giving the site a homey and feel-good vibe. The textures used throughout range from bricks and slightly gritty paper, to bright lights and a cityscape, so you get the feel of the city, as well as a bit of a modern diner sentiment. The colors also play a large role in the design, featuring a lot of darker colors in the textures, with bright red and vibrant blue from the logo used throughout as accents. We also chose some fun photos that are displayed on each page in a casual manner by overlapping a few photos, giving it a nice detail. Other great details are used throughout to complete the unique look of the design.